This is the Synergy N7 Flybarless Torque Tube Nitro Helicopter Kit. The Synergy N7 is coming. A nitro powered 700 class helicopter with modern mechanics and an innovative design is long over due. Get your fuel jugs ready as the N7 is the beginning of a nitro revolution. Neutral CG Fuel Tank: Quite possibly the first nitro powered helicopter to ever boast a neutrally positioned fuel tank. Historically, fuel tanks have been located either far behind the main shaft, or far in front of the main shaft which means your Center of Gravity will change drastically from the beginning of the flight until the end. Changes to the CG during flight negatively affect flight characteristics. The Synergy design allows the N7 to stay balanced on the main shaft through out the entire flight! Modular Frame Design: The Synergy N7 is comprised of a front frame which is separated from the rear frame. This means if you have a crash and break the front quadrant, you only have to replace the front quadrant. Separating the frames provides easy maintenance and reduced flying costs. The frames are joined by three T6-6061 Aluminum bearing blocks and a rigid carbon fiber bottom plate. Direct Drive CCPM: Modern flybarless electronics are designed with a direct to the swash linkage in mind. Why add the complexity and weight of bell cranks when it is not needed? Giant CNC Delrin Helical Main Gear: The custom helical angle ensures smooth, quiet power transfer with minimal motor loading and instant recovery after a load. Mod 1.25 CNC Delrin Tail Drive Gears: These beefy gears will withstand even the most aggressive 3d pilot! Do not settle for molded gears in a model helicopter!! 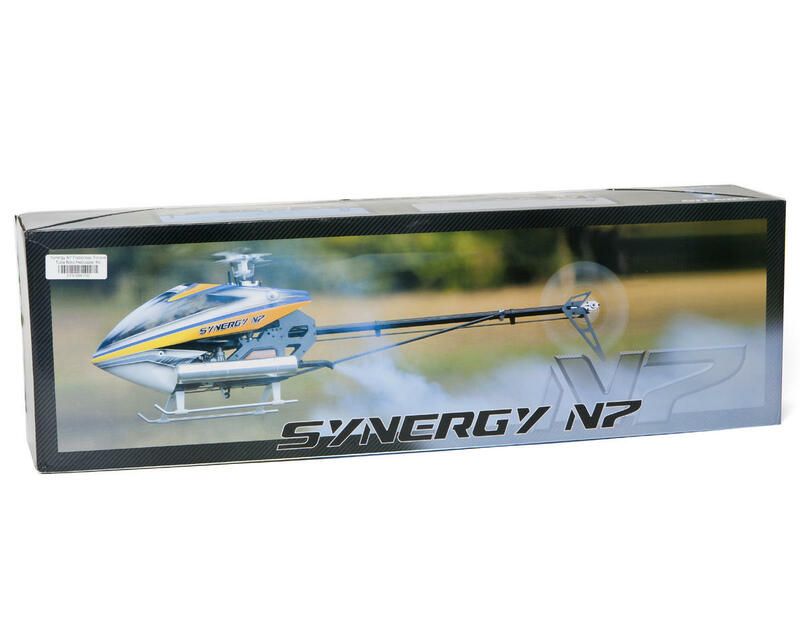 Ultra Light Weight: Weighing in at 9.5lbs (without fuel) the Synergy N7 is one of the most aggressive nitro model helicopters ever to be produced. High Detail Canopy: A high-detail canopy stylized with unique scalloping and side molding really makes the Synergy N7 helicopter stand out. Adjustable Tail Ratio: Want to run a higher head speed but maintain a reasonable tail speed? No problem, the Synergy N7 comes stock with a 4.9:1 tail ratio that can be changed to 4.5:1 if you desire. 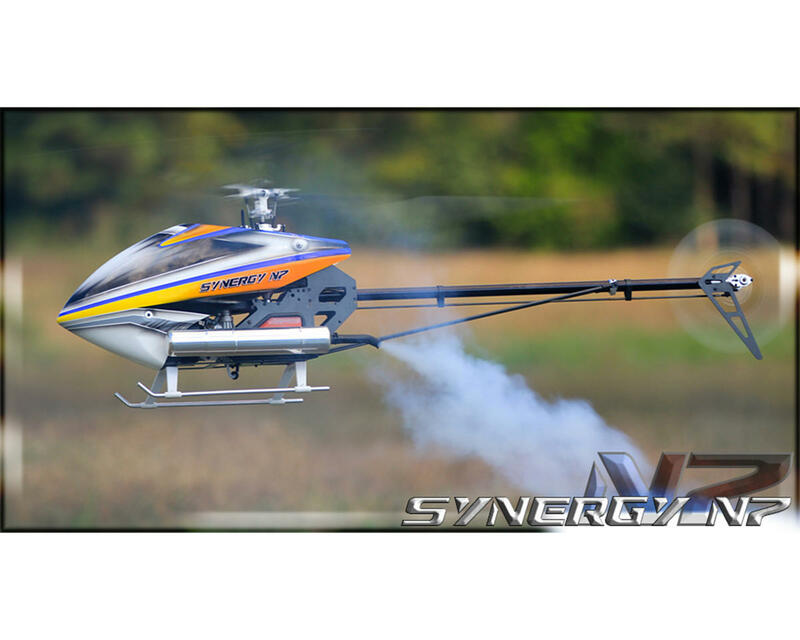 Multiple Main Gear Ratios: Want to run the Synergy N7 as a 600 class helicopter with a 90 nitro motor? Want to run the OS GT15 gas motor at a different gear ratio? You can do it! The Synergy N7 includes a 17 tooth pinion and a 139T main gear. Optional pinions are available to accommodate many different configurations. Many More Features: There are many more features and options with the Synergy N7. This page will be updated as more details are released. Great high Quality kit! i would highly recommend this 700 size nitro model! the build was smooth and the online manual was top notch! awesome helicopter from Matt Botos! I've been out of the RC heli hobby for several years now (tried drones kinda ho hum). The last helicopters I had were the JR Vibe 90SG / Jr Vibe 50 / and an Align 450 Pro. This kit is one of the best I've ever built, no issues at all 100% quality parts and documentation. Flies incredible also, just finished breaking in the engine and looking forward to lots of flying. Simply the best most reliable and best flying 700 nitro in production. Maybe one of the best Nitro Helis ever. This heli stands out as having the lightest disc loading of any. It performs all the maneuvers well. It is built strong where it needs to be and lightweight in every other aspect. The build is very satisfying and instructions are clear. Hands down the best nitro helicopter on the market. Quality of parts and materials, product support, clever design, durability and flight characteristics are what make this model as good as it is. Matt is a legend in the hobby and puts 110% of himself behind his brand and supporting it. I have had my N7 for 2 years and it has never given me a single drama. Best model heli I have ever owned. This is by far one of the best helicopters I have owned. Be sure to follow instructions, nothing is pre-loctited. Make sure you properly secure the 320-406 11mm Pin for 18T Bevel Gear. You loose the pin, you loose tail control. I suggest double set screwing the tail pin in the tail shaft. Enjoy it, once you build it. 6 months ago I received mine, and since then have put really close to 20 gallons of fuel through it. Here is my setup Os91 speed, cgy750, bls175 cyclic, bls256, Rail 696mm/106mm. Flying this helicopter is as close as I have been to bliss! Absolutely solid air frame requiring very little maintenance, put it together and feed it fuel. Thanks Mr. Botos for the best Synergy model yet (who knew it could get better). I have been fying for 8 years this by far is the best nitro 90 I have flown very high quality. Thank you Amainhobbies for the best price and fast shipping. Also thank you Matt for making another great machine to add to my Synergy helicopter collection.